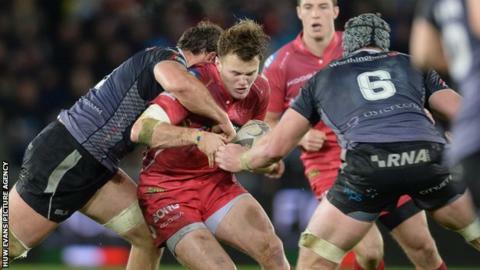 Scarlets centre Steffan Hughes could be out for up to a years after suffering a major knee injury. The Wales Under-20s captain was hurt playing for Llanelli in the Swalec Cup last weekend. Hughes, 20, is behind Regan King and Scott Williams in the Scarlets centre pecking order but has huge potential. "It's really bad luck for Steff, he had a serious knee injury in the game at the weekend that he played in," Scarlets coach Wayne Pivac said. "He's torn his ACL [anterior cruciate ligament], his PCL [posterior cruciate ligament] and his lateral ligament in his knee. "So there's three there and also the hamstring so it's a very, very serious injury. "However, it's one that with corrective surgery and with a lot of good work with good people around you... he will be back playing, but he could be out for around about 12 months."